The France international has not featured for the Gunners since November and has emerged as a target for a number of Premier League teams Sam Allardyce fears his transfer plans will be ruined by Arsene Wenger’s refusal to let Mathieu Debuchy leave Arsenal. The Sunderland manager is looking to bolster his relegation threatened side with several new additions before Monday’s deadline and confirmed he had made an enquiry for the France international. 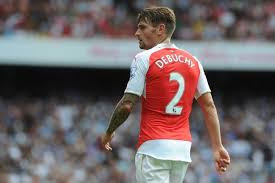 Debuchy has not featured for Arsenal since November but with Hector Bellerin the club’s only other recognised right-back, Allardyce believes his old foe Wenger will be reluctant to do business. Sunderland are currently in 19th place in the Premier League - they sit four points from safety.